Sombrero Books is delighted to announce the publication of Mexico by Motorcycle: An Adventure Story and Guide. Author William B. Kaliher is widely published and a regular contributor to Mexico Today. He has been traveling Mexico’s highways and byways since 1964. A born storyteller, he holds a BA in Cultural Anthropology from the University of South Carolina. Mexico by Motorcycle: An Adventure Story and Guide includes numerous photographs and describes Bill Kaliher’s travels off the beaten track in Mexico by motorcycle in 1971 and again in 1993. 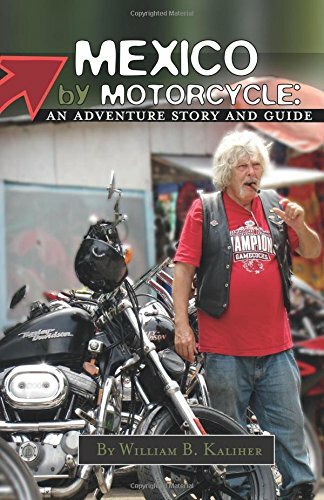 With travel tips and sound advice gained since his first trip in 1964, this is a book for the armchair traveler, the bike aficionado, and Mexico fans. Read it before you cross the border, then tuck it in your backpack or purse as a reference on the road. Join the author as he chats about changes in Mexico over the years, cultural differences between the USA and Mexico, Mexican motorcyclists and Bike Clubs, and shares driving tips, historical facts about Mexico, the best cities, regions and sites you might want to visit, and his invaluable insights gleaned from six decades of visiting Mexico. This 272-page book also includes a handy fold-out map showing the routes described in the text. Mexico by Motorcycle: An Adventure Story and Guide is currently available as a regular softcover book (272 pages); an e-book version will be released shortly. Initial reviews on Amazon.com are highly favorable. Buy your copy today!